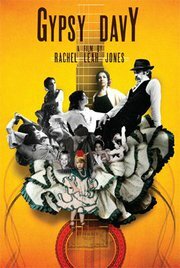 This Documentation is composed of various segments of the documentary "The Flamenco Clan." I have selected only scenes about Pepe Habichuela and edited them together! I don't agree with this word "Ghetto" at all!!! Who are these bloody Australian Journeyman Pictures people? Whatever, the documentary is still worth posting. I'm fascinated to find anything with English subtitling or dubbed about Flamenco. Your thoughts mi familia flamenca? Am I the only one, or should I just let it go? Fiery taps and stern looks define a stirring flamenco performance. For those who can master it, there's money in it. But flamenco started life as the lament of an oppressed people who left India centuries ago before some settled in Spain -- the gypsies. Today their inspiration comes from the Seville ghetto. It's so run down the state no longer collects rent. The police barely patrol here -- outsiders enter only with permission. Gypsy dons Ramon and Jose are in charge, a pair who have made their fortune from flamenco. Today they foster new talent. Many of their songs recall centuries of racist abuse, where speaking their language could mean your tongue was ripped out. 'We had to express ourselves in this way' says Ramon. 'With flamenco we sing our sadness, our joys and all our feelings'. Flamenco's power is deep within -- a force called duende -- the spirit -- that can be moved by great sadness or joy. For the ghetto youth, life's harshness has given them great emotion to draw on. COMING SPRING 2012. Visit www.holaflamencofilm.com for more information! 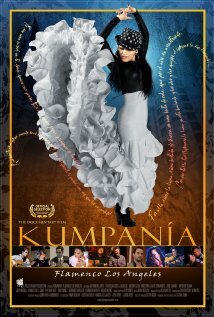 The mysterious pull of an old Spanish Romani art form on a group of contemporary musicians in Los Angeles is the essence of the documentary film "KUMPANIA Flamenco Los Angeles." Directed by Katina Dunn, Cinematography by Avi Cohen, Film Editing by Noah Berlow & Executive Produced by Kevin Dunn. An official selection of The Buffalo International Film Festival 2011. Starring Antonio De Jerez, Vanessa Acosta-Albalos, Mizuho Sato, Briseyda Zarate Fernandez, Jose Tanaka, Timo Nunez, Paloma Rios, Kai Narezo, Tony Triana, Gerardo Morales, Gabriel Lautaro Osuna, Joey Heredia, Deborah Lawler and Bruce Bisenz. Katina Dunn was a journalist for decades starting at City News Bureau in Chicago and The SouthTown Economist, publishing in the Chicago Tribune, The Chicago Reader and Newsweek, among other periodicals. As a teenager, she studied at the Art Institute and American Academy of Art. She graduated Northwestern University in 1980. Later, she was Image Editor and columnist at the Orange County Register and founded the Mt. Wilson Observer newsweekly in 2008. She studied filmmaking with Film Independent and the International Documentary Association. In 2010, she was accepted to Werner Herzog's Rogue Film School. Rajamani (Texas Indian Gypsy) singing a deep song in his style blending Spanish with Tamil. It may sound like flamenco music but it is not. It is what Rajamani creates and performs. Rajamani's music portrays the ancient roots of Roma/Gypsy music. When an American white-boy with Alabama roots becomes a Spanish Flamenco guitarist in Andalucian boots, what happens along the way and behind the scenes? The film tells the story of David Jones, stage name: "David Serva," through his five women and five children—one of whom is the director. After all, who knows the man who came and saw and conquered, “strumming their pain with his fingers, killing them softly with his song,” better than they? A tale about self-invention and the pursuit-of-happiness (no matter the cost to others), part duel and part duet—between a camera pointing daughter and a guitar wielding father—GYPSY DAVY is a personal and political portrait of a man, a family, a generation. 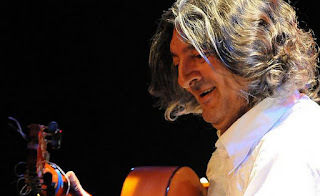 Entre Flamenco Company was founded by Antonio Granjero in 1998. Based originally in Madrid, Spain, and under other working title and name, the company traveled throughout the Iberian peninsula being presented in places like the Palau de la Musica de Barcelona, Festival de Verano de la Communidad de Madrid and Ciclos Culturales de Alcala de Henares (Madrid). Later, the company has traveled throughout the United States and Central America performing in Houston Hobby Center (Houston, TX), Charline McCombs Empire Theatre (San Antonio, TX), Festival Flamenco de Santa Barbara (Santa Barbara, CA) and Teatro National de Panama ( Panama City, Panama). A preview for the upcoming flamenco documentary: "Spanish Day" (working title), that I shot over the summer in Andalucía, Spain. Including the great cantaora Ines Bacan! About Cihtli Ocampo: A life-changing moment can occur after deep soul-searching. Or it can sneak up and wallop you when you're brushing your teeth or watching a baseball game. This film celebrates the culture and struggle of the Gypsy. There is a new generation of Roma who claim their Gypsy roots with pride, while fighting the myths that caused their parents to live in fear. They call themselves by their rightful name, the Roma. The Roma people have suffered almost a thousand years of persecution - from European Slavery to the Holocaust - yet they have survived as a unique global culture. The film explores the music and culture borne out of centuries of exile. Opre Roma invites you to a wedding and to an evening of flamenco dance, with songs from Turkey, Romania, Spain, the Czech Republic and Slovakia that relate a shared experience telling the story of what it means to be Roma. Internacional de Flamenco, 11/ 2011. 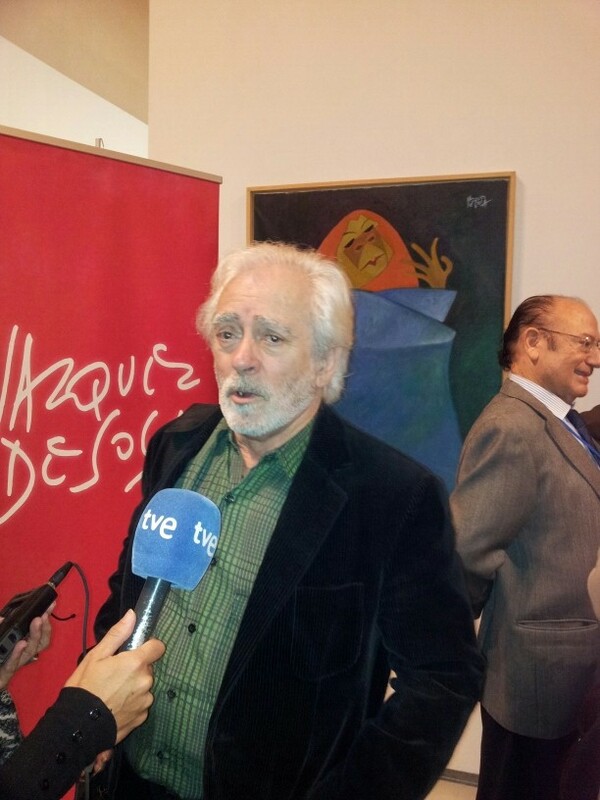 Manolo Sanlucar interpreta Torre Bermeja. 2ª Guitarra - Manuel Dominguez Macias. Percusion - Jorge Aguilar Enciso y Francisco Gonzalez Agudo. Palmas - Carlos Carmona y Sarai Carmona. Baile - La familia de Antonio el Pipa, tia Juana,tia Antonia,tia Curra y tia Salvaora. Composer and concert guitarist, Manolo Sanlúcar was born in the picturesque town of Sanlúcar de Barrameda in Cadiz, Andalucia, on 21 November 1943. Together with Paco de Lucía and Serranito, Manolo Sanlucar revolutionised concert guitar playing in the twentieth century. His ability to innovate and his continuous search for new possibilities have led him to compose works that have a strong personal emphasis, which is always related to what he calls learned music, but without losing its Andalusian flavour. In fact, he was the first artist who brought flamenco to the Teatro Real in Madrid. Fantasia para guitarra y orquesta, Trebujena, Medea and Soleá -which were performed by the Ballet Nacional de España- Tauromagia and Aljibe are some of his works. Several young artists who are now great guitarists were once his protegés, like Vicente Amigo and Rafael Riqueni. 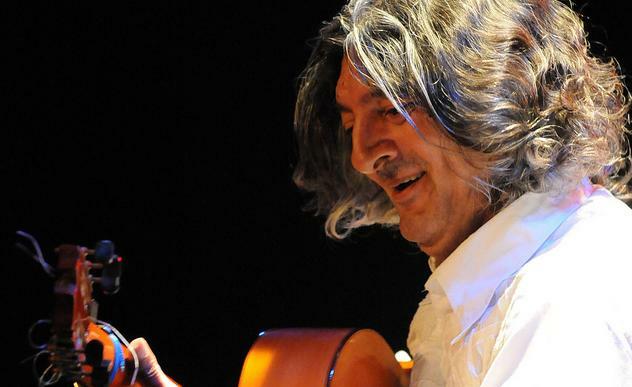 Moraíto Chico II, a Flamenco guitarist from Jerez de la Frontera, Spain, has produced solo albums as well as being the regular accompanist for José Mercé, Diego Carrasco and other popular flamenco singers. His real name is Manuel Moreno Junquera, and he was born in 1955. He is the nephew of the original Moraíto (Manuel Moreno a.k.a. Manuel Morao), and son of the original Moraíto Chico (Juan Moreno). 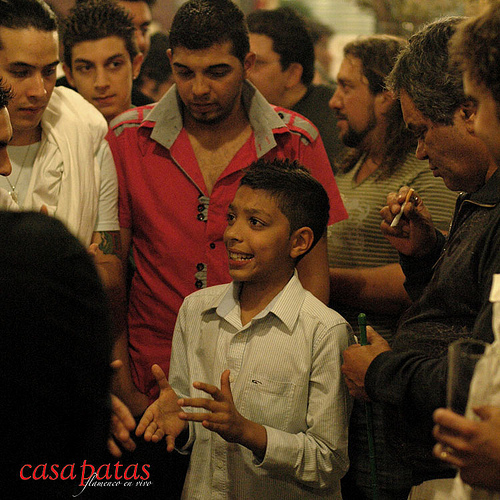 CASA PATAS EN VIVO 48 - ABRAHAM MOTOS "MORENITO DE CAÑO-ROTO"
Enough cannot be said for the amazing archive of videos from Madrid's-own Casa Patas Tablao and Foundation. Hold on to your hats y gracias Casa Patas this kid is amazing!! !